Daily Resort Charge will be added to the room rate and includes WiFi kids12/under 50PCT off breakfast / free dinner 2 waters daily fitness center / golf practice facility access free club rental after 2pm Disney shuttle lazy river tubes 20PCT off spa / 10PCT off cabanas local/toll free calls. Non Smoking. Hilton Orlando Bonnet Creek offers the best of both worlds a convenient location surrounded by Walt Disney World Resort and the peaceful serenity of the surrounding 482-acre nature preserve. With 1 001 spacious and elegantly appointed guest rooms and an array of family activities and premium amenities this resort is certain to make your visit to Orlando a treasured memory. The heart of the resort is the award-winning 3-acre lazy river pool with water slide. Relax amid lush tropical landscaping and crystal clear water sparkling in the Florida sun and enjoy daily poolside activities and luxurious cabanas. Hilton Orlando Bonnet Creek offers complimentary transportation to Disney Theme Parks. The resort also features world-class dining with nearly twelve restaurant and lounges including the acclaimed La Luce inspired by renowned celebrity chef Donna Scala. Plus Kids Eat Free for breakfast and dinner at Harvest Bistro as part of the daily Resort Charge. 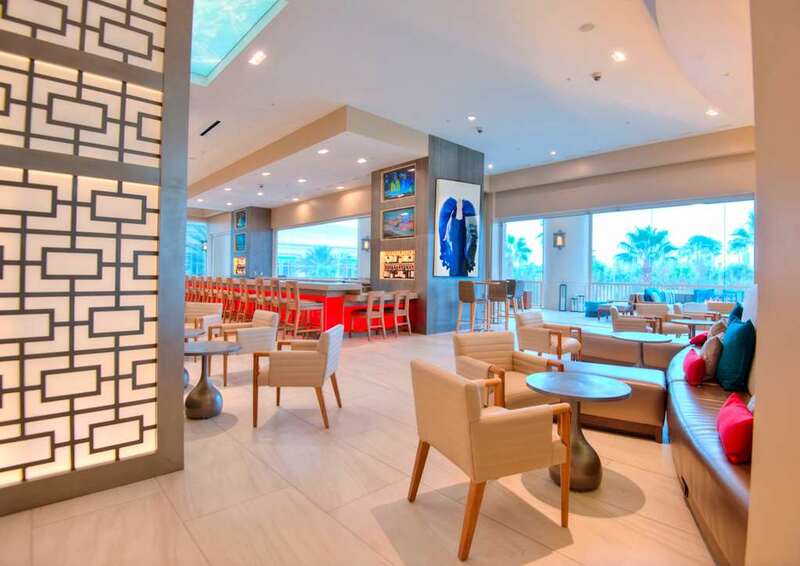 Guests of Hilton Orlando Bonnet Creek are invited to enjoy the facilities and amenities of the adjacent Waldorf Astoria Orlando including the Rees Jones-designed championship golf course Waldorf Astoria Spa and access to the WA Kids Club. When it comes to impeccable service Hilton Orlando Bonnet Creek is second to none. Harvest Bistro: A family-friendly American Bistro featuring healthy cuisine made from farm-fresh ingredients. Bull - Bear: Bull - Bear is located at the adjacent Waldorf Astoria Orlando. The original in New York is famed for being the first to serve USDA-Certified Angus Beef on the Eastern Seaboard. Enjoy the finest steaks and seafood in this elegant restaurant overlooking the golf course and pools of the Waldorf Astoria. La Luce: La Luce serves modern Italian cuisine inspired by Napa Valley famed chef Donna Scala. Dishes are inspired by traditional family recipes that have been handed down for generations. Enjoy freshly handmade pastas pizzas and seafood in a contemporary setting overlooking the sprawling lazy river pool. MUSE: Enjoy specialty coffees gourmet chocolates and pastries and grab-and-go specialties at MUSE located right off the lobby. It*s perfect for a light morning breakfast or afternoon treat. OPEN 24 HOURS. Aquamarine: Aquamarine is the pool-side grille at the adjacent Waldorf Astoria Orlando with fresh salads and tempting grilled favorites. Oscar*s: Located at the adjacent Waldorf Astoria Orlando Oscar*s offers contemporary American dishes and re-interpretations of dishes created at the original in New York such as Eggs Benedict in a casual setting. Open Daily for breakfast. Beech: A family-friendly American bistro featuring healthy cuisine made from farm-fresh ingredients.